Sunday 18th September 2016 saw the return of our Winsford club instructor, Lyndsay Walkinshaw to the competition ring, for the first time in over 2 years, at the Unified ITF English Championships and for the first time competing in the Ladies Black Belt 18-35yrs category. Miss Walkinshaw was put straight in against one of the England Team ladies who did so well at this year’s European Championships and turned in a sublime performance which was recognised by the judges awarding her the round 4:1. The category continued and eventually came the final between undoubtedly the 2 best ladies in the group. Once again, we were treated to a performance worthy of a World Championships with a virtually flawless, skillful and powerful display from both ladies, there was literally nothing between them, although a couple of the judges did seem to miss the glaring mistake that should have awarded our girl the Gold! (we have the video evidence lol) Anyway, after a tense few moments the 5 judges gave their decision 3:2 in favour of the much elder and more experienced competitor from Liverpool. 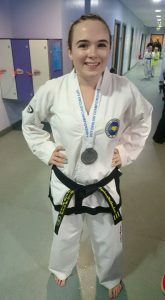 We are all delighted that Miss Walkinshaw is back to competing after so long out following her knee surgery and to claim such a well deserved Silver medal in her first National Championships as an adult is testament to the countless hours of practice and dedication she puts in, both at the club and at home.